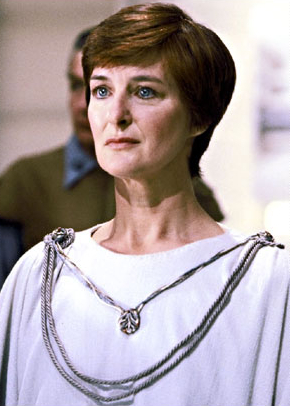 A stern, stately woman, Mon Mothma was the Supreme Commander of the Alliance to Restore the Republic. Mothma was an influential loyalist Senator in the final days of the Galactic Republic. She was one of the first to be wary of Supreme Chancellor Palpatine's policies during the Clone Wars. When Palpatine created a system of territorial governors to report to him directly, Mothma realized that the Senate was quickly losing its last vestiges of political influence. She worked closely with Bail Organa of Alderaan to organize fellow Senators who shared similar ideals and outrage. The original cabal that tentatively explored what few options remained included Senators Chi Eekway, Terr Taneel, Padmé Amidala, Fang Zar and Giddean Danu, but it was her and Organa who remained at the core of this nascent Rebellion. Mothma remained a senator until the end, despite her opposition to Palpatine's policies. When the outrages became too difficult to ignore, and the debate moved from the Senate floor to the battlefields of distant worlds, Mothma helped forge the Alliance that eventually toppled the Empire and restored freedom to the galaxy.